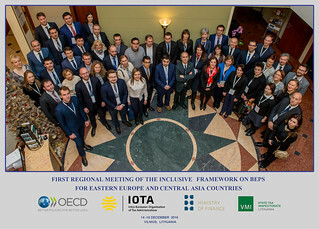 16/12/2016 - More than 60 delegates from 14 countries gathered in Vilnius for the first regional meeting of the Inclusive Framework on Base Erosion and Profit Shifting (BEPS) in the region after its launch in Kyoto on 30 June-1 July 2016. This meeting was the last of a series of regional events in 2016 intended to offer countries in different regions of the world the opportunity to feed their views and provide their input into the Inclusive Framework on BEPS. The event was hosted by the Ministry of Finance and the State Tax Inspectorate of Lithuania, and organised by the OECD in partnership with the Intra-European Organisation of Tax Administration (IOTA). The meeting was attended by senior officials from Ministries of Finance and Tax Administrations from Bulgaria, Croatia, Georgia, Hungary, Kazakhstan, Latvia, Lithuania, Montenegro, Poland, Romania, Slovakia, Slovenia, Turkey and Ukraine as well as by business representatives from international firms such as Ernst and Young, KPMG, PricewatherhouseCoopers and from Lithuanian corporations and associations such as Cobalt, Lithuania Tax Consultants Association, Rödl & Partner, Sorainen and Valiunas Ellex. Dainoras Bradauskas, Director General of the State Tax Inspectorate of Lithuania, welcomed the participants and the opening remarks were delivered by Daiva Brasiunaite, Director of Tax Policy Department at the Ministry of Finance of Lithuania, and Miguel Silva Pinto, Executive Secretary of IOTA. The meeting was co-chaired by Audrone Misiunaite, Deputy Director of Tax Policy Department at the Ministry of Finance of Lithuania and Eugenijus Soldatkovas, technical taxation expert at IOTA. This meeting allowed participants to discuss the latest developments on the implementation work on BEPS, in light of the debates taking place in the Committee on Fiscal Affairs' Working Parties. Participants were also updated on and provided input to the work on the toolkits aimed at addressing the specific needs of developing countries in implementing the BEPS measures. These discussions provided the ideal forum to obtain input into the work and on the priorities of the participating countries and their needs in relation to capacity building and training. Read the summary of the discussions.